Abu Adnan recalls the trouble began getting worse in late 2004. As a Christian family in Baghdad they had taken care and kept a low profile during the aftermath of the invasion and continued with their lives. The first sign of real trouble came when their daughters were accosted outside of school and told to cover their hair when they were in public. The second episode was more threatening. Gunmen tried to grab one of the girls, as they ran away the assailants yelled after them that they would kill them if they saw them uncovered again. Then in July of 2005 their son Adnan was working in a market. Three masked gunmen entered the store, blindfolded him and bound his hands. They robbed him of cash and his more valuable merchandise. They destroyed what remained. They warned him about the consequences of speaking to anyone about the incident and hit him over the head before leaving. When he returned home he told his father he had to get out. The young man left Baghdad for Damascus with his two sisters in September 2005. Remaining behind, Adnan’s parents began staying inside only venturing out when necessary. A family friend reported to them that he had begun receiving threats because of his work with an American defense contractor. He ignored the threats because he needed the work to provide for his wife and three year old son, Selmed. On December 14th 2005, while Abu Selmed was at work, there was a knock at the door. When Um Selmed answered she was gunned down in the doorway. The only witness was little Selmed. When they left the gunmen took the boy with them. At the memorial service the distraught father received a phone call. The son would be released when a $25,000 ransom was paid. Abu Selmed sold all his possessions, family and church members contributed money as well. Abu Selmed moved in with the family of Abu Adnan. The ransom was paid and later that evening Selmed was found wandering in the neighborhood unharmed. Abu Selmed left for the safety of Syria. 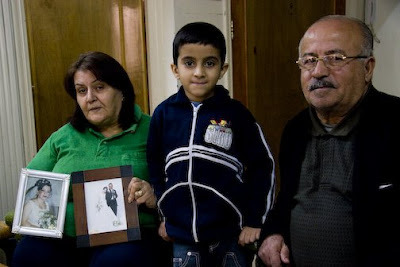 Abu Adnan, his wife and his mother moved from their house but steadfastly remained in Baghdad. After 2 months they too fled to Syria.